Dan and Rachel Weseman, the SPA/Panther people, Will have their flying 3.3 liter (3,300 cc) Corvair on display at Oshkosh 2016. This displacement Corvair is achieved by using an American made billet crankshaft with a 5/16″ stroke increase, along with the large cylinders of a 3,000 cc Corvair. The engine has had more than a year’s development and testing, including extensive ground runs, professional dynamometer testing, and now flight testing, conducted on a Panther airframe. 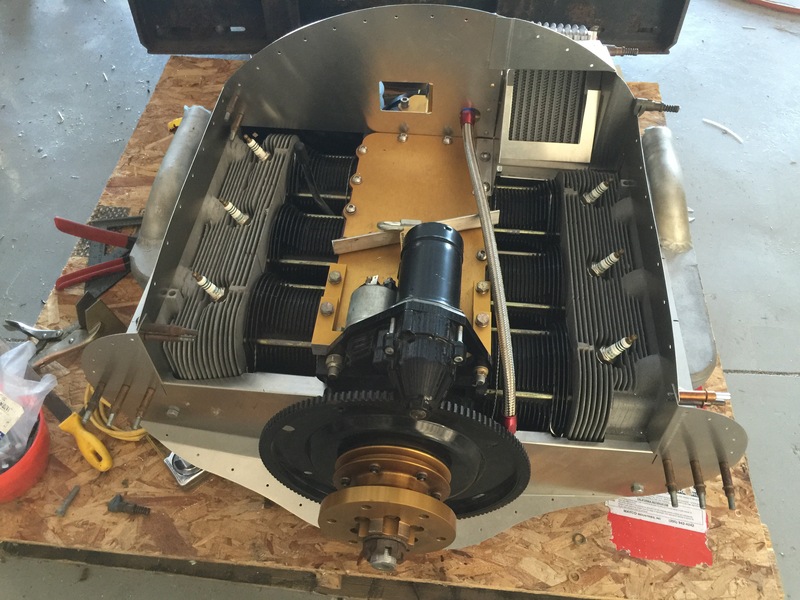 The engine has proven to be an outstanding powerhouse with very smooth operation. Above, Dan Weseman’s #.3 Liter Corvair getting dressed out with baffling just before it was installed on a Panther airframe. The best way to understand this engine in a nutshell is this: It is lighter and more compact than a Continental O-200, yet dynamometer tests show it can match the power output of high HP Lycoming O-235, at the same RPM. For more pictures , get a look at this story: Baffling on 3.3 Liter Corvair . The heart of this engine is the new, billet, made in America crankshaft. A standard Corvair has a 3.437″ bore and a 2.940″ stroke, yielding a 2.7 Liter displacement. Increasing the bore to 3.620″ with larger pistons and cylinders increases the displacement to 3.0 Liters. When that is combined with increasing the stroke by .312″ with a new crankshaft, the displacement becomes 3.3 Liters. Externally, the engine remains the same size as all the Corvairs we have made for the last 27 years, but it is actually substantially lighter because the new crankshaft is lighter than the original GM crank, as are the new cylinders. “There is no Replacement for Displacement” is a time proven axiom of American automotive performance. It has been the traditional method of power increase. To increase the engines’ displacement, rather than try to get more work from the same size motor. The fundamental logic of this approach is it keeps the engine stress and rpm low, the keys to reliability. The same logic has always been used by American aircraft engines. The same way Continental developed the 177 cubic inch/65HP A-65 into externally same sized 200 cubic inch/ 100HP O-200, The 3.3 moves the Corvair from a starting point of 164 cubic inches/100HP to 200 Cubic inches (3.3 Liters) and 125HP, without increasing the external size of the engine. This isn’t a new aviation idea. A Lycoming O-235 is nearly identical in size to the engine it later evolved into, the O-320. The engines that emerged from this process, the O-200 and the O-320 have outstanding reputations of reliability primarily because they were good designs to start with, and they raised their power output my increasing their displacement, not asking a small motor to work harder. The 3.3 is the most expensive Corvair flight engine ever built, but it still is less expensive, in some cases by half, than other engines in it’s class. At Oshkosh, all the tire kickers want to compare price tags, but any serious builder understands he is in search of good value, which in a serious subject like aviation, is not synonymous with cheapest price. Consumer culture has conditioned people to obsessively seek out the cheapest price on things. That mentality may work when comparing blenders at Walmart, but an Aviator selecting a power plant for his home built needs a mindset driven by value. By this measure, the 3.3 and all Corvairs stand up as proven, well supported options for homebuilders. I have said many times, Corvairs are not for everyone, but they are an excellent choice for builders who understand their value. The quote “Most people know the cost of everything but understand the value of nothing” still holds true about most of our society. My work with Corvairs and their isn’t going to change society’s short comings, it is just to provide individuals with good options that make sense when examined closely. The 3.3 Liter engine from the Wesemans is a further extension of this concept. Is this a New Engine? Yes: The only parts in a 3.3 liter engine that were ever in a Corvair automotive engine are the two case halves, the bare cylinder head castings, and the rear accessory case casting, and these parts have been carefully inspected, extensively machined, and completely remanufactured. All the other parts in the engine, The Crankshaft, connecting rods, pistons, cylinders, valve train, gears, bearings and accessories are all new. Nothing in this engine was taken straight out of a salvage yard. More importantly, the new parts are not just new automotive parts, they are components specifically designed and tested to work as parts in a flight engine, a much more rigorous standard. The 3.3 liter Corvair uses all the same installation components as our other Corvairs use, the same mounts, exhausts, cowls and intakes. It is also fully supported by our builder programs like Corvair Colleges and Corvair Finishing Schools, and our private on line builders groups. A builders selecting a 3.3 Liter Corvair is part of the same community of Corvair builders that we have developed and supported over many, many years. Above, Dan and Rachel stand on either side of their 3.3 engine at Oshkosh 2015. The engine is a further development of many years of previous work with Corvairs. It has been carefully developed and tested before being offered as an option for builders. To see a video of an early test run, check out this 2015 link: SPA / Weseman 3.3 Liter Corvair now running. 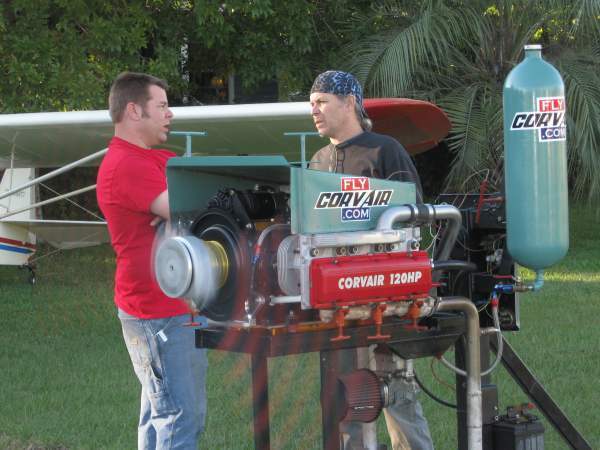 Above, Dan Weseman and I in 2012 at the test run of his 3,000 cc Panther engine. No person flies a Corvair harder than Dan, this fact combined with his mechanical talents and conservative approach to development, make him the right person to develop a large displacement engine. His 3.0 liter performed flawlessly through a full years of aerobatics, and this itself built on many years of flying a 3,100cc engine in his Sonex airframe. The 3.3 is a further development, made of the same materials and processes as the 3.0 Liter, tested with the same methods. To Learn more about 3,000 cc engines read these links: Why Not the Panther engine? and The Panther’s engine, worlds strongest Corvair flight engine. The saying that I’ve heard in racing is, “There’s no substitute for cubic bucks.” By putting in the work to build your own Corvair flight engine, there is a substitute for cubic bucks: your careful work. In addition, since the Corvair is a 6 cylinder engine, it is smoother than the 4 cylinder Lycoming O-235 because all of the power pulses overlap..
Congrats on the success of the 3.3L. It is no surprise it is successful given the background and experience of those involved in its development. I’ve been flying my 3L for about three months now. I cannot express enough how pleased I am with it. It has considerably more power than the 2.7. My takeoff run on floats is about 1/3 less. I can only imagine what the 3.3 would be like in comparison. I had a demo ride in the Zenair Cruzer at the Zenair open house in Ontario two weeks ago. I am very impressed wit it. Nicholas did a great job handling it in 15+ kt. 45 deg. crosswinds at Midland Airport. I believe this will be my next aircraft (retirement) project powered by either my 3L or the 3.3L. what is the total weight of the 3.3 engine? How short would the prop have to be for the 3200rpm? Jim at 215 pounds, engine is about 20 pounds less than an O-200 Continental, and about 20 pounds more than a Rotax 912. The allowable diameter not only depends on the RPM but also the forward velocity of the plane. A Zenith 750 stol with a 3,200 rpm Corvair can use a 68 or even 70” prop. A 165mph Panther turning 3,200 rpm will be limited to a 64” prop. True tip speed on a prop is the vector addition of both the rpm and the forward speed of the plane. -ww.